Start by deciding what raw material you want to dump into your pipes—the inputs. Pipes can work with RSS feeds, HTML in a Web page, XML-defined data, and even information from a Yahoo Search or a Google Base database. 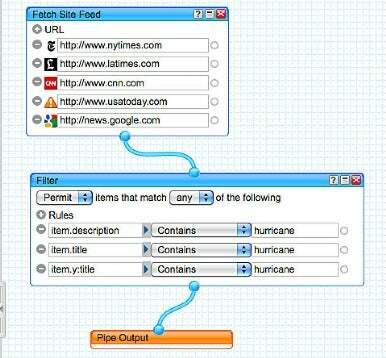 Add RSS feeds to your Yahoo Pipe by pasting the URLs into the Fetch Site Feed input source. Each site’s favicon—a square Web site icon, usually customized for a site’s design—should automatically appear to the left of each URL if Pipes was able to retrieve the site’s main RSS feed correctly. You’ll see a question mark if no icon is available. If you see a yield sign, you need to double-check the URL. Drag the Filter tool to your Yahoo Pipe’s page and set criteria to determine what can pass through from your input sources to your custom feed. Click in the field under Rules to bring up a menu of tags used in the RSS feeds. Here you can select what descriptive information—for instance, author, pubDate (for the date an item was published to the feed or in a publication), and title—you want to focus on. In this case, I’m trying to cast a broad net, so I select item.title, item.description, and item.y:title. (Depending on what feeds you use in your pipe, you might not see an item.y:title entry. This is a special definition in one of the feeds. The other item entries are more generic RSS field names.) For each field, I set the middle option to Contains and then enter “hurricane” in the text field to its right. The finished pipe contains links between its various items and ends with Pipe Output. You can test how your filter is working by using the Debugger pane at the bottom of the window. Make the window bigger by dragging the resize bar (center of the separator line) higher. The late senator, Ted Stevens, was widely ridiculed for describing the Internet as a series of pipes, but this wasn't an inaccurate summary, in many ways. Yahoo has taken that metaphor to new lengths. Use this tool to turn the Internet into a set of filtered pipes that filter the mass of information for you, delivering only what you need.